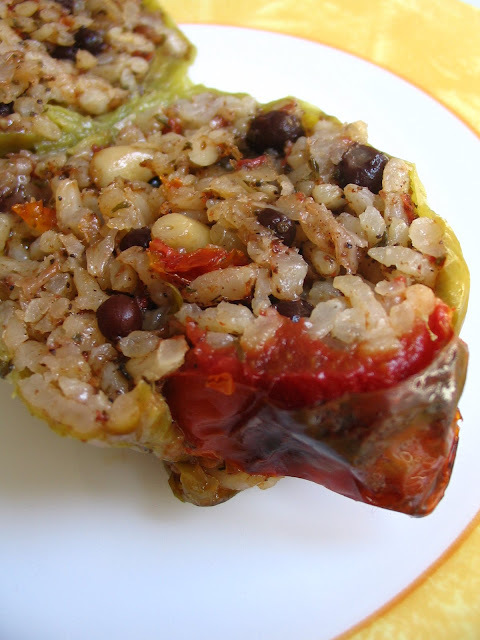 Another great traditional olive oil dish recipe: Stuffed peppers with olive oil. Olive oil dishes are cooked only with olive oil; best when they're served cold; and are usually summer dishes. There are two ways to cook stuffed peppers with olive oil: on the stove and in the oven. In my family we like baked stuffed peppers. Here's another certified Turkish recipe from my mom. -Mix well all the ingredients (except for peppers and 1 tomato) in a bowl. -Wash peppers and take out the top part and the seeds. -Stuff the peppers with the rice mix with a spoon or your hand. -Cut small pieces from 1 tomato to cover the top part of peppers. Press the tomato slice down a bit so that it won’t come out. 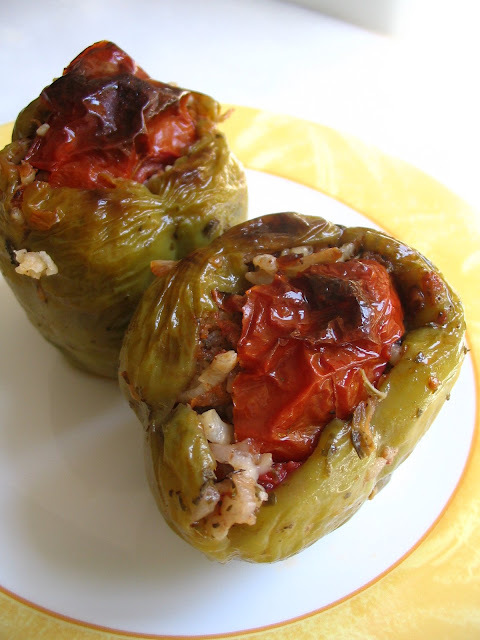 -Place the dolmas in an oven dish which is as tall as dolmas. Pour on top 2 cups of boiling water. -First let it boil for 5 minutes on stove. Than, bake it in a preheated oven at 400F for 35-40 minutes until rice is cooked and tops are browned. Check them regularly if you don’t want to burn the tops. -It’s better cold, but good when it’s hot, too. I stuffed little orange eggplants with thin noodles and peppers and onions, but I LOVE the idea of putting the tomato slice on top to keep it all moist and in one piece. Thanks so much for the idea! I'll try this again Burcu....I am loving your blog with all its beautiful and creative presentations. I'll bet the food tastes as good as it looks!The Stuffed Peppers I will definitely have to try this weekend after my Saturday morning trip to our local farmer's market!! ingilizce nizani....he he. Bu tarifin türkçesini gönderirseniz sevinirim. Ayrıca size mail de gönderdim. blog 'unuz harika ayrıca türkçe versiyonunu da yayınlarsanız nefis olur. Sevgiyle kalın. My Italian grandmother and mother have made stuffed peppers since before I was born and I continue to make them today. Ours are typically made with a bread stuffing and seasoned with basil, parsley, olives, and cheese. I just love the seasonings and ingredients you've put in these peppers, though, and will definitely be trying them. Thanks for the new twist on an old favorite! Gorgeous pictures. I love this way of fixing peppers, but yours looks the best I've ever seen. Dolmalar muhteşşem görünüyor, elinize sağlık! Thank you all for your flattering comments. 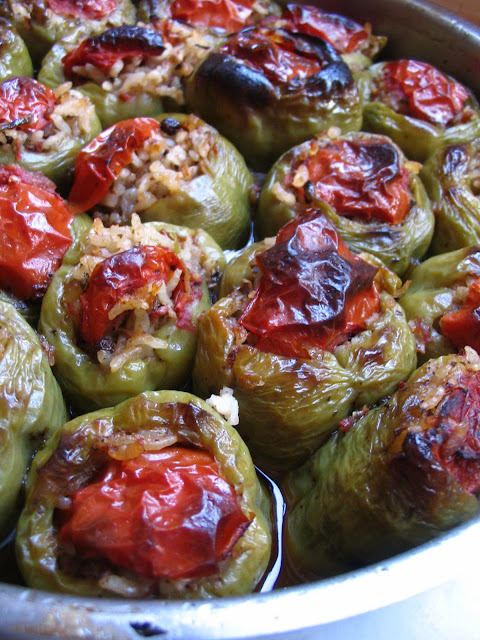 I'll let my mom know about them since she told me the recipe and made that delicious dolma. These look delicious! I love dolma's! Should I mix in uncooked rice or already cooked rice? Thanks:) I actually just made them and they turned out lovely. Where do you find bell peppers small enough to stuff? All I can find around the bay Area are huge ones. I was able to find smaller ones only once at a Farmer's Market. Is there a trick? Pinar, I usually find small bell peppers at the Farmer's market. But I agree it's not easy. It also helps if you have a friend who garden. And sometimes if I find only one or two bell peppers at the market, I wash, seed, and freeze them, until I find 6 or 8 of them to make a batch. Oh, I never thought of freezing them. Good to know they turn out ok like that. 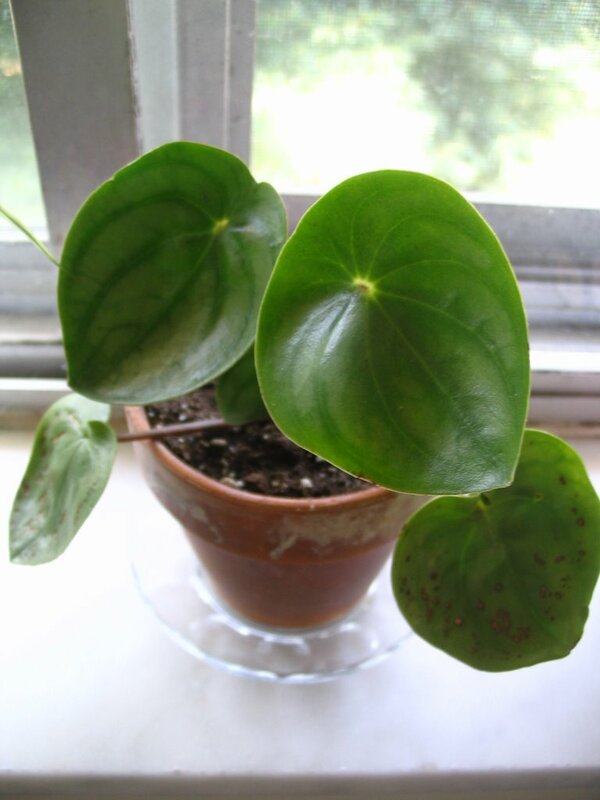 I garden, but I haven't really found the right variety seeds or starter plants to garden either. Besides, they don't come out all the same time. Could you ask your gardening friends what kind of peppers they grow? It would be great to know for next year. Pinar, I cannot remember the name of the peppers I used, but I will ask my friends as soon as possible. Amanda-Sorry, I didn't see your comment. Yes, raisins would work. But, it's better if you chop them into smaller bits before adding them to the stuffing. Ilana, I think with brown rice cooking time would be a problem. By the time rice is cooked the peppers would be all mushy. However, if you cook the rice before hand and increase olive oil it might turn out well. I met your blog when I was searching biber dolması recipe on the web. One of my Porteguese friends liked that meal when she visited my house in Izmir. My mum cooked it for her and she liked it a lot. After she return to Portugal she asked me the recipe and I find your website at that time. It was very helpful. Thanks for that. Have a nice day! I cooked the peppers much longer than the recipe indicates, but the rice was still not done. What did I do wrong? Was there still juice in the pot? Your blog is extremely interesting. An ode to Turkish cuisine. I love it. I am Greek (Canadian) and our cooking is, for obvious reasons, very similar. When we make this dish we usually stuff peppers and tomatoes. We saute the rice in olive oil and minced onion and we add the liquified pulp from the tomatoes along with a little boiled water. We let it simmer for a few minutes before stuffing the tomatoes and peppers, so that the rice is partially cooked. 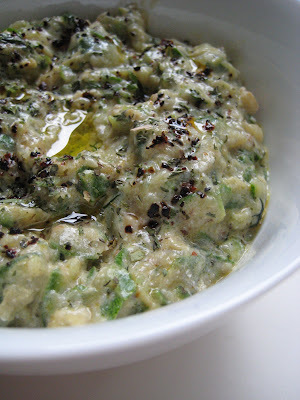 We don't put currants or allspice, just lots of chopped mint, parsley and pine nuts. We also cut 3-4 medium size potatoes in 4 pieces and place them between the stuffed peppers and tomatoes. I get a lot of ideas from your recipes and enjoy using them sometimes to make my dishes new and interesting. Keep up the good work and thank you. These were absolutely delicious. I don't usually eat stuffed vegetables, these are my new exception. thank you! you have a beautiful sit! Hello, I have been wanting to make this dish as my local Turkish restaurant makes it and it is really good! So, you put in uncooked rice? And pour boiling water over the whole dish? That cooks the rice? Do you cook the dish uncovered when it is in the oven? Yes the rice is uncooked and boiling water should come a bit more than half way through the dolmas. You first cook it on stove and once it starts boiling transfer it to the oven uncovered. Thanks Burcu. I made this this evening for dinner. They were very yummy and tasted authentic. The rice at the tops of the peppers weas still a tiny bit crunchy even though I baked them for over 1 hour. Next time I might pre-cook the rice slightly as other recipes suggest.